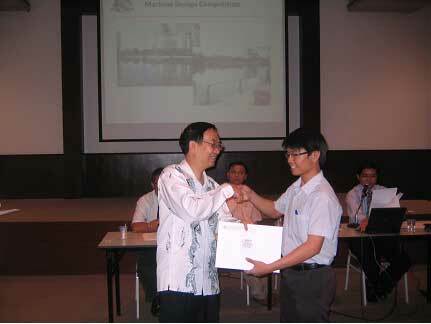 A team of Mechanical Engineering undergraduates from Universiti Tunku Abdul Rahman (UTAR) bagged the second prize of the METD Machine Design Competition (2010) organised by the Mechanical Engineering Technical Division (METD) of the Institution of Engineers, Malaysia (IEM). The winning team comprised Wong Hon Sern, Lee Yih Jun, Lim Kee Chean, Loh Kwan Jou and Teh Cheu Chyong who took home RM1,000 and certificates for their efforts. 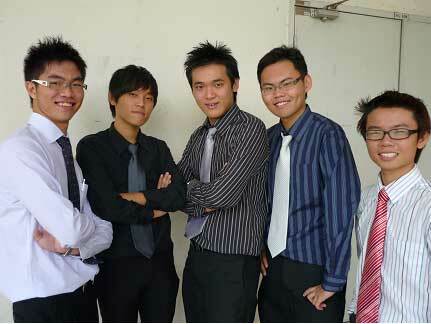 They received their rewards from the President of IEM Ir. Professor Dato' Dr Chuah Hean Teik who is also the President of UTAR at a prize-giving ceremony held on 16 October 2010 in Wisma IEM, Petaling Jaya. Wong attributed his team's success to teamwork. He said, "I would say cooperation is the root of success to our team." "Every group member has participated actively in the brainstorming session and has never complained about the continuous burning of midnight oil to complete the report in time," he added. According to their lecturer Wong Hong Mun, the competition served as a platform to derive realistic ideas from participants. "It was a good experience for the students besides the theory aspect of their studies. The winning team strived hard for one and a half months to conduct research, sketch and come up with the final version of the design to fulfill the requirements of the contest," he said when contacted. Three other teams from UTAR also took part in the competition, which was held for the first time and open to professional engineers, engineering graduates and students, including lecturers in the faculties of local Universities. Participants of the competition were required to conceptualize and design a Lake Clean-up Machine for a 10-acre lake located in Taman Tasik, Petaling Jaya. Designs must be practical, functional, and able to rid the lake of floating weeds, decaying garbage, algae and mud suspension. The submission of design up to the conceptual stage for the competition included isometric sketches and diagrams of a lake clean-up machine and its accessories.